At 40, Michael Levitt had a major health issue, lost his job, his car was repossessed, and his home was foreclosed on, all in 369 days. After that year of such significant losses, he redirected his focus, rebounded and reinvented himself. On a mission to teach people how it all happened to him and help bring people back to life, so that they can make the crucial changes in their lives to prevent those losses from happening to them, Michael authored the book, “369 Days: How To Survive A Year of Worst-Case Scenarios”. In 2016, Michael launched BreakfastLeadership.com, offering online courses, tools and resources that help individuals and leaders within corporations (re)learn boundaries in their work and personal lives, they can accomplish more, by doing less, which will save their careers and possibly their lives. 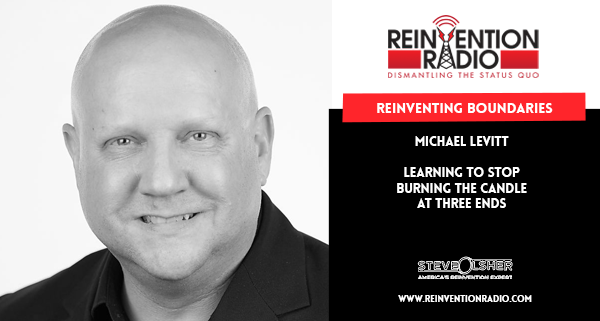 TUNE IN to hear Michael discuss with Steve, Mary and Richard boundaries and learning how to stop burning the candle at three ends. Why do people allow their boundaries to be violated? Don’t lift the red carpet, it’s scary what’s underneath it! Short of dying, they couldn’t take anything else away from me — it was a relief to finally be over. If you don’t schedule it, you’re not going to do it. Reinventing Brand Awareness – In this episode, Jeremy Slate discuss with Steve, Mary and Richard reinventing brand awareness and creating your life on your own terms.